Pope Francis is making his first telephone call above the earth -- and into space. On Thursday, the pope called the International Space Station. Six astronauts are currently working there -- three Americans, two Russians and one Italian. Italian astronaut Paolo Nespoli was aboard the space station for the first-ever papal call, made in 2011 by Pope Benedict. He returned to space in July. As he did in 2011, he acted as a translator Thursday during his second papal call. Francis asked Nespoli and the five other astronauts many questions. Some were simple, such as ‘why did you choose to become an astronaut?' Other questions were much deeper and more complex. Russian astronaut Sergey Ryazanskiy told Francis that his grandfather, a Soviet engineer who helped build Sputnik, had inspired him. Some of the responses he received from the Russian astronauts marked a small step in improving the Vatican's relations with Orthodox Russia. Francis has worked hard to improve the relationship. Last year, he became the first pope in 1,000 years to meet with the Russian Orthodox patriarch. The other Russian aboard the International Space Station is Alexander Misurkin. He responded to Francis's question about how the astronauts understood the Italian poet Dante's line that love is the force that moves the universe. Misurkin told the pope that he had been reading Antoine de St. Exupery's "The Little Prince" while in space. He explained that the young prince's understanding of love affected him. Francis responded by saying "It's clear you have understood the message that St. Exupery so poetically explained, and that you Russians have in your blood, in your humanistic and religious tradition." 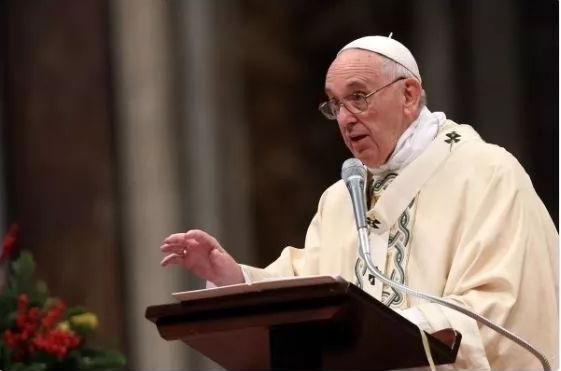 Pope Francis considered a career as a chemist before becoming a priest. He has often expressed his concern for the environment and care for what he calls "our common home." Space station commander Randy Bresnik, an American, told Francis that what he enjoyed most about being in space was seeing "God's creation maybe a little bit from his perspective." Bresnik, a U.S. Marine, flew combat missions during the Iraq war. He told Francis that in space there are "no borders, there is no conflict, it's just peaceful." Nespoli thanked the pope for his deep questions. He said that most of the crew's days are spent performing highly technical and mechanical tasks. Since his launch in July, Nespoli has published beautiful photos of Italy from space on his Twitter page; one of his recent pictures shows the Alps from 400 kilometers above the Earth. Francis is known for making out-of-the-blue -- or unexpected -- phone calls. But Thursday's call had been planned for a long time. The European Space Agency made the arrangements, with NASA's technical support. His objective was to kill the space station project altogether. 5. "You took us away from the daily mechanics of things and made us think about things that are bigger than us." 6.But Thursday's call had been planned for a long time.